Today, more people are focused on health, fitness and preventative healthcare through better dietetic habits and an online nutrition degree will give you a place in a fast-growing profession. Online nutritionist degree programs help the students in gaining skills required to evaluate dietary requirements, identify nutritional deficiencies, create specific diet plans for a healthy lifestyle, and suggest supplements and vitamins. As a professional nutritionists and dietitians, you can make real differences in people's lives by helping them stay fit and healthy and live more productive lives through better nutrition. Everyone enjoys food, and your expertise will help people make better food choices to boost health and wellbeing. Also, many organizations such as schools, hospitals and sport associations rely on professional dietitians to help them design specialized nutritional programs to foster strength and stamina. If you want a science-based career in which you can help people live better, healthier lives, you should seriously consider an online nutrition degree. Who Would Benefit from an Online Nutrition Degree? Distance learning today is truly coming of age, and a field like diet and nutrition fits perfectly well in a virtual classroom. While online learning is not for everyone, it is ideal for independent-minded people who are too busy living life to take time off attending traditional college classes. Nutrition is a science-based field, so people entering online nutritionist degree programs should feel comfortable learning about biology, physiology, chemistry, and other hard sciences, as well as psychology and culture. Most nutritionists require certification from local state agencies, but on the other hand, you can earn your online nutrition degree in less time than if you attended a campus-based program. Organized self-starters blossom in online classrooms, so if you are driven, disciplined, and ambitious, an online dietician degree program may be the kick you've been looking for to launch your new career. What Might You Learn in an Online Nutritionist Degree Program? Dietitians are experts on how the foods we eat affect our overall health. In an online nutrition program, you will study the physical sciences to get a deeper understanding of why nutrition and diet matter to people's health. In addition to gaining a strong background in biology, you will also learn everything about food and how diet affects the human body, including courses on food safety, nutrition science, nutritional analysis and assessment, anatomy and physiology, dietary supplements, metabolic diseases, and nutritional health. Electives will give you a broad foundation for a successful career. Your curriculum will often depend on level of the degree and your individual goals. Nevertheless, after completing your online nutrition degree, you will have extensive knowledge of all the major aspects affecting nutrition and diet, qualifying you for excellent career opportunities. Improved public awareness about health, fitness, and disease prevention has opened various career opportunities for dietitians and nutritionists. Online nutrition degree makes you eligible for exciting nutrition-related careers in hospitals, clinics, fitness centres, and community health programs. You can also work in government organizations, food and pharmaceutical industries as a research specialist. With significant experience, you can do private practice or work as nutritionist consultant for large corporations, schools, sports associations, resorts and restaurants. Increased public awareness about the effects of diet on health is making a captive audience for nutritionists, who increasingly are stressing the benefits of a mostly plant-based diet. USA is suffering from obesity spate since very long time. But with increased health consciousness and dietitians' advice, people are moving away from processed foods and choosing more natural products. 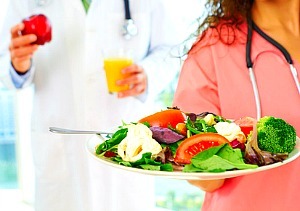 Nutritionists are in higher demand in places where they have never been seen before, such as corporate offices and resort hotels. This trend is good news for more career opportunities in this field. Your online nutrition degree will fill your career prospects with tempting opportunities. eDegreeSteps is your best recipe for reliable information about great online nutrition programs.